Babanjaoji Shinde Suger & Allied Industries (Babanjaoji Shinde Suger & Allied Industries Limited), Solapur Published Job Notification for 09 Management Trainees – Civil Draftsman & More Posts. Candidates who wish to apply must look at Babanjaoji Shinde Suger & Allied Industries Recruitment 2017. Eligible candidates can apply offline within 07 days from the date of publication. Education Qualification: BE/Diploma in Electrical Engineering/LLb/LLM/ITI/MBA/B.Tech and more. For Post wise Education Details follow the detailed advertisement. 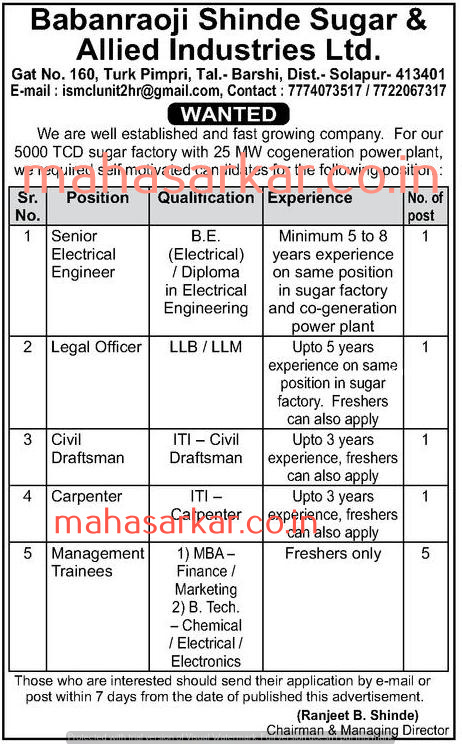 Interested & Eligible candidates can send their application along with all the necessary documents and testimonials to Babanjaoji Shinde Suger & Allied Industries Limited, Gat No- 160, Turk Pimpri, Tal- barshi, Dist- Solapur-413401. Starting Date, Last Date to Apply offline at Babanjaoji Shinde Suger & Allied Industries Limited which candidates should be remember as follows. Start Date to Apply offline: 14-11-2017. Last Date to Apply offline: Within 07 days from the date of publication.